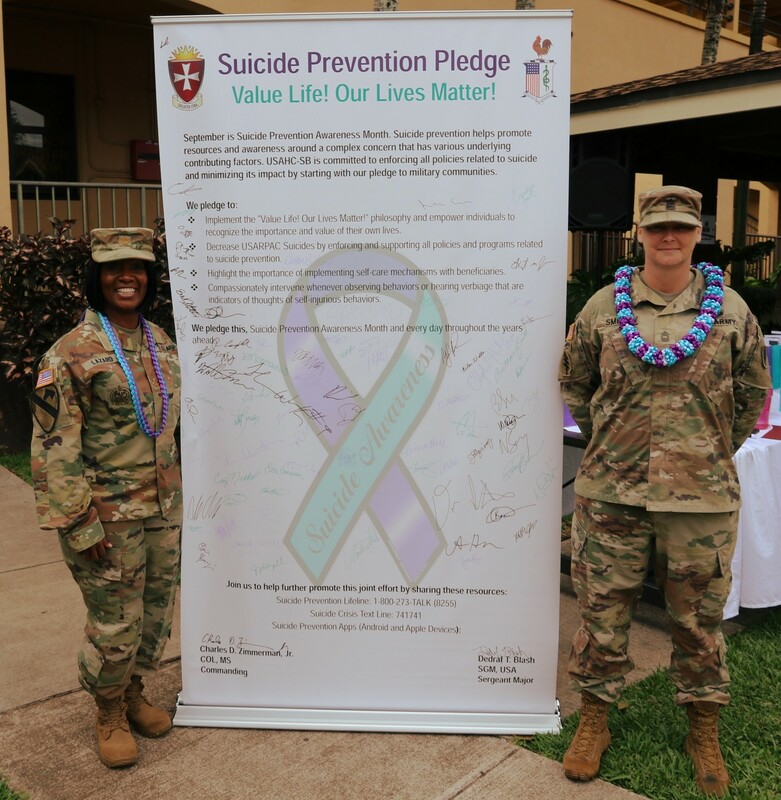 SCHOFIELD BARRACKS (Sept. 15, 2018) -- The U.S. Army Health Clinic- Schofield Barracks hosted a Suicide Prevention Pledge for the clinic staff and Soldiers at the USAHC-SB campus on Sept. 14, 2018. 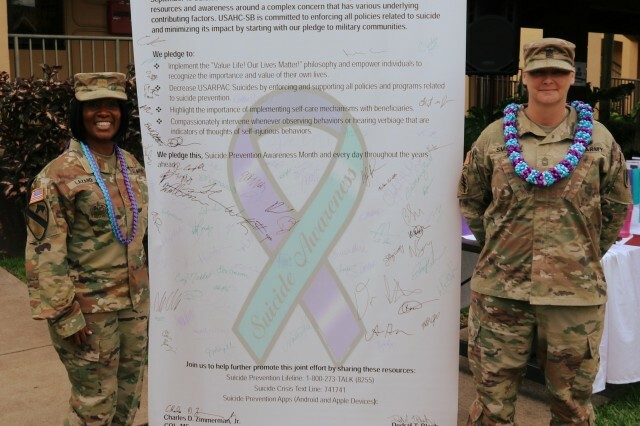 The pledge brought together leaders from across Schofield Barracks and focused on the great strides behavioral health experts have made in previous years and the work that can still be done by leaders at all levels. 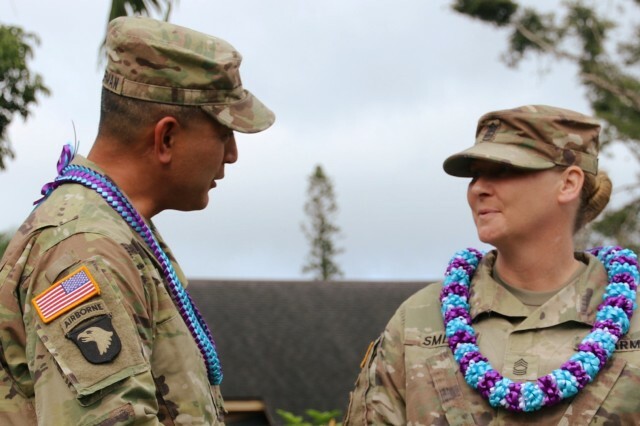 "There are many ways that individuals can be there for service members and veterans, including calling, reconnecting, or checking in on their loved one who may be struggling," said Maj. Darlene Lazard, director of training, USAHC-SB. "Everyday connections can make a big difference to someone feeling alone, in crisis, or having suicidal thoughts." 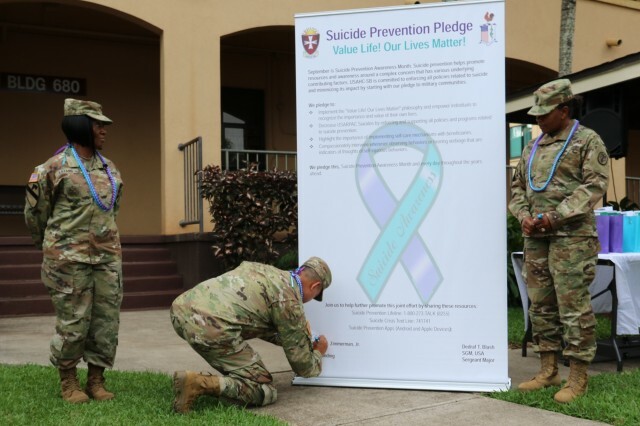 September is Suicide Prevention Awareness Month and a time when the clinic diligently highlights the importance of implementing self-care mechanisms for Soldiers and beneficiaries. "Remember, suicide is a complex behavior associated with a wide variety of risk factors," added Lazard. "It affects individuals of all ages, ranks, races and education levels." The guest speaker for the Suicide Awareness Pledge, Master Sgt. Candice Smith, senior enlisted medical advisor, 8th Theatre Sustainment Command, emphasized awareness and shared advice for assisting others during interventions. "This generation of military service men and women have seen more than their fair share of tragic, not common circumstances," said Smith. "We have lost battle buddies, we have had to take others people's lives in order to protect ourselves and others, divorces are out of control, some financial problems trying to support our family on a small paycheck and men self-medicate to help them cope by drinking or substance abuse." Smith encouraged the attendees to educate themselves, talk to their families and help them get comfortable with talking about suicide. "I ask that all of you take suicide awareness seriously, don't have the 'it's not going to happen to me mentality'," said Smith. "Be able to ask 'are you thinking about suicide'." Suicide Prevention Month encourages the use of '#BeThere' to embolden people to think about the many ways they can help themselves. "Her (Master Sgt. Smith) story was all too often the story we hear about from other MOS's and jobs," said Staff Sgt. Marleen Milligan, behavioral health specialist, USAHC-SB. "To hear it come from someone in our field, was very humbling." Deaths as a result of a suicide are a preventable public health concern and a top priority according to the Department of Defense. The Military Health System continues to work with military and civilians organizations to build awareness of suicidal behavior and risks; help service members and their families cope; and promote programs that instill the skills needed to manage life's trials and encourage those with suicidal thoughts to seek help. Following the formal remarks attendees joined the USAHC-SB command group and formally pledged their commitment to implementing the 'Value Life! All Lives Matter!' philosophy to empower individuals to recognize the importance of their own lives by signing the suicide prevention pledge.